Klong Toey Port is where the smaller cruise ships dock when they visit Bangkok. The port is 26 kilometers up the Chao Phraya River and is right in the heart of Bangkok city. It's commonly known as Bangkok Port and was Thailand's only major port for sea transportation of cargo from 1938 until 1991. The construction of Klong Toey Port began in 1938 and finished after the end of World War II. The port is located on the Chao Phraya River not far from Gulf of Thailand. Due to its limited capacity and traffic problems caused by semi-trailer trucks, much of the shipping operation has been moved to the new container terminal at Laem Chabang in Chon Buri Province. In the past Klong Toey was the major night entertainment area for the whole city of Bangkok. 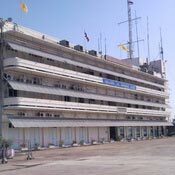 It had its heyday in the 1960's and 1970's dying out almost completely in the 1980's when the Bangkok Port Authority claimed the land that was home to the majority of the night entertainment venues. 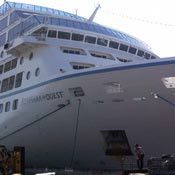 The whole area is a bit tatty and grubby, like any port, but the positive side for the cruise ships docking here is that they are right in the centre of Bangkok and are not subjected to the two-hour drive from Laem Chabang. 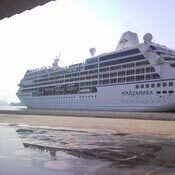 Cruise ships using Klong Toey Port during the 2009-2010 season include Azamara Quest, Seabourn Odyssey, Seabourn Pride & Oceania Nautica.